Join us for a sailing vacation that’s packed with terrific conditions, beautiful landscapes, historically significant ancient ruins, secluded islands, vibrant nightlife, a warm culture and terrific cuisine – Greece is a great sailing venue. Located on the southern end of mainland Greece, Marina Zea is perfectly situated for an exhilarating sailing vacation through the wondrous Saronic Gulf. This cruising ground provides travelers with a wealth of opportunities to experience Grecian culture through ancient ruins, towering landscapes, good food and so more. Explore vibrant islands like Poros and Hydra or kick back on Cape Sounion Bay – the choices are as limitless as your imagination. A Marina Zea sailing vacation in the Saronic Gulf features shorter passages, wind and waters that are well-protected and relatively flat. We are planning a week SOS bareboat cruise from Saturday, September 10 to Saturday, September 17, 2016. We plan to reserve Two 43.3 3/3 mono hulls from Moorings in Zea that will accommodate 5/6 persons and 4600 Club Cat 4/4 that will accommodate 7/8 persons at a little more cost per person. We plan a round trip cruise from Marina Zea starting Saturday 9/10/16 afternoon at 3pm, when we get our boats to Friday 9/17/16 at 5:00 pm when all boats must be returned. We will sleep on our boats Friday night and disembark by 8 am Saturday 9/17/16 morning. A local captain will be hired for daily briefings and local knowledge for the 7 day itinerary and the cost is included in the pp cruise costs. We have reserved two 44i 3/3 mono hulls for a 14 day cruise from Saturday September 10 to Saturday September 24, 2016 from Sun Sail in Zea. 14 day cruise boats must be returned by 5:00 pm Friday September 23, 2016. Disembark by 8:00am Saturday September 24, 2016. We are making hotel reservations for everyone on the cruise for Friday, September 9, 2016 in Athens at a hotel near the Marina Zea, and included the one night cost of the room double occupancy in your estimated cruise cost. The cost of this 7 day Athens cruise 43.3 monohull is $1550 for members and $1600 for non-members of SOS. The cost for 7 day 4600 Club Catamaran is $1800 for members and $1850 for non-members of SOS. The cost of the 14 day cruise 44i monohull 9/10/2016 to 9/24/2016 from Sun Sail is $2300 or $2350 for non-members. The cost includes seven or fourteen nights on the boat; Yacht Damage Waiver; a Moorings Charter Care Protection Plan (only for the time on the boat) Travel Ins., and a Med. Service Plan during the trip. Airfare to and from Athens and local transportation to the Marina Zea are NOT included. Which are non-refundable after a person submits a deposit check with the application and waiver and has been put on the cruise list of potential sailors. Do not make airline reservations until you have been invited by skipper if crew or confirmed as a skipper for this cruise. A preplanning party will be arranged at a later for those who sign up for this cruise. Skippers and crew who wish to be a part of this wonderful trip should get their applications completed as soon as possible and submit with a deposit of $450. ($500.00 for non-members) to Alex Daly, 5 West Farmington St., Fenwick Island, DE 19944. Subsequent payments $600 due Dec. 1, 2015, final payment of $500 due May 1, 2016 for the 7 day cruise 43.3 3/3 Moorings mono hull. Cost for the 7 day 4600 Club Cat cruise are deposit of $450. ($500 for non-members), subsequent payments $700 due Dec. 1, 2015, final payment of $650 due May 1, 2016. Cost for the 14 day 44i 3/3 Sun Sail cruise are deposit of $450 ($500 for non­-members) subsequent payments of $950 due Dec. 1, 2015, final payment of $900 due May 1,2016. To obtain an application with the waiver go to the Singles on Sailboats Website, click on Bareboat Cruises, download a copy of the application and for Athens, fill it in and the Waiver, and send it to Alex Daly along with your deposit check. For questions and more information you may email, Alex Daly, the Athens 2016 Cruise Coordinator, at alexdaly@comcast.net or call 410­-218­-0726. This is a great opportunity to sail in beautiful waters and visit ancient cites and other sites. Join us for a great SOS Bareboat Athens Cruise next September! Can request a chart briefing for Skippers and 1st Mates, recommend at 1:00pm. Tourist town. Historical buildings, nice beaches. 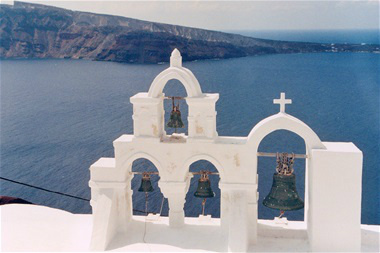 2nd largest Saronic island Picturesque town, many churches, Temple of Aphaia. Pistachios are the main export here. *Two week Itinerary will continue to explore the Saronic Bay, returning to Zea by 5:00 pm Friday, September 23, 2016 Disembark Sun Sail by 9:00 am Saturday September 24, 2106.